Discover by bike all that Tuscany has to offer, with the people who know it best. On the first part of the week you will cycle surrounded by the beautiful landscape of Val d’Orcia, UNESCO protected site, and you can visit some nice towns including Pienza, Montepulciano and Montalcino. On the second part you will cycle through the Crete Senesi region to Chianti, famous for its wine. Meet our staff at Chiusi-Chianciano train station at 12.00 pm (a stop on all major Florence-Rome lines), and private transportation to Palazzo del Capitano, ancient building of XIV century trasnformed in an elegant and charming 4 stars hotel at San Quirico d'Orcia, in the heart of Val d'Orcia. Check-in into your room and welcome aperitif to introduce the Tuscany Bike Tour before the first delicious dinner in typical restaurant of San Quirico d’Orcia. The landscapes of the Val d'Orcia region, one of the most beautiful place in Tuscany and UNESCO world heritage site. Visit of Pienza, the "ideal" city of the Renaissance time, also famous for its Pecorino cheese. A quick stop at Montepulciano, with its winding streets and squares. Monticchiello, a small medieval and charming town. Light lunch with Pecorino cheese tasting in typical farm and dairy. Climbing up to Montalcino, town of Brunello wine. 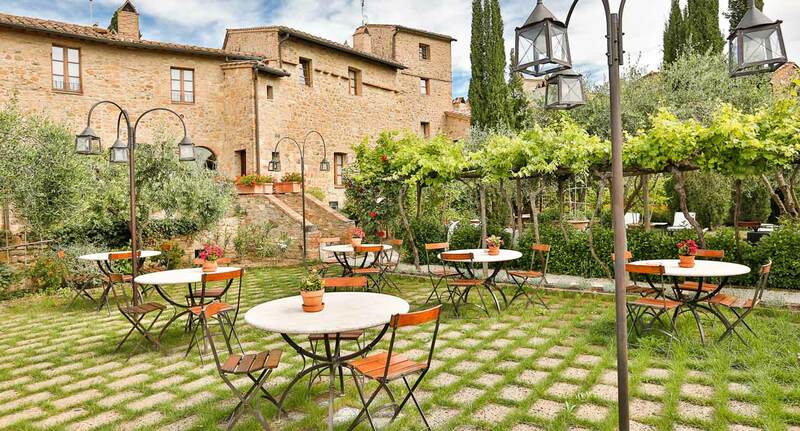 Visit of Montalcino, medieval town surrounded by vineyards and beuatiful view on the valley. The Abbey of Sant’Antimo, one of the most beautiful romanic church in Italy. Climbing again towards Castiglione d’Orcia and Rocca d’Orcia, the beautiful landscapes will compensate the challenging ascent. Lunch at Bagno Vignoni, cute medieval town where the main square of the village is a big thermal pool which contains the original source of thermal water. Take a relax break before the last dinner at the local osteria. An unforgettable ride surrounded by the views of the Crete Senesi to the edge of the Chianti. The Crete Senesi region, where badlands and biancane characterize the landscape in this part of Tuscany. A short break at Asciano with its churches and museums. 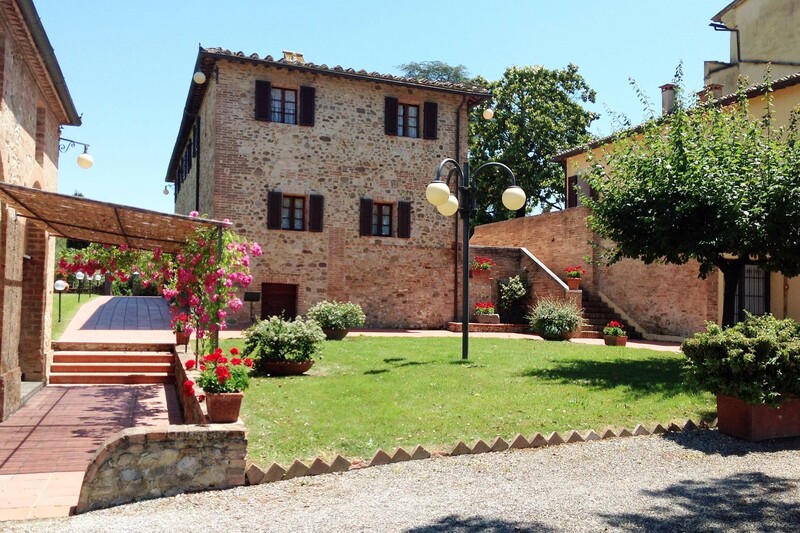 Lunch and wine tour and tasting in a Chianti winery located at Castelnuovo Berardenga. Dinner and accommodation at Villa Curina Resort. Castelnuovo Berardenga and its landscape museum. The passage in Siena, with its medieval city center, the Duomo and Piazza del Campo - The Montagnola Senese, riding through woods and crossing the Via Francigena pilgrimage route - Monteriggioni, known throughout the world for its extraordinary well-preserved old town and walls - Climbing up to San Gimignano, “City of Beautiful Towers” - Lunch and wine tour and tasting in a winery along the route. Check-out and transportation back to the starting point of the tour or to Florence (hotel of the city center, train station or airport. Otherwise you can decide to add more days of your stay. Discount for private transfer on day 1, if you arrive with your car.